Custom SYSTEM 45 test kits allow small-scale mock-up installation prior to larger volume purchases. Select from the list of standard colors or designate custom color (if known). Select proper grade to match substrate mechanical properties and composition. Dry Color Paks, produced in same substrate as the CUSTOM 45 to be tinted, can be used for field tinting or adjustment or matching of colors. Select substrate under "Options". Custom SYSTEM 45 products are offered in non-pigmented formulas to produce economical, highly durable and compatible repairs to natural stone and masonry for situations where matching patch color is not required. Select proper grade to match substrate mechanical properties and composition. RL-Series latex-modifiers are unique, reactive acrylic additives designed to enhance the performance of Portland cement-based materials. When added to cement-based mortars, patches, plasters and coatings, RL-Series latex modifiers improve mechanical performance, workability, adhesion and resistance to harsh environmental exposures. RL-Series Restoration Latexes RL-1, RL-2, RL-4, RL-5, RL-6, RL-7 RL-Series latex-modifiers are unique, reactive acrylic additives designed to enhance the performance of Portland cement-based materials. When added to cement-based mortars, patches, plasters and coatings, RL-Series latex modifiers improve mechanical performance, workability, adhesion and resistance to harsh environmental exposures. 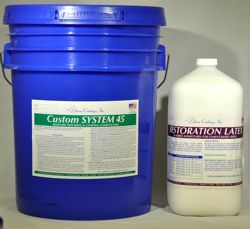 Restoration Latexes RL-3 is a unique, reactive acrylic additives designed to enhance the performance of Portland cement-based materials which are subject to water immersion.